Information from InciWeb.nwcg.gov. We will update this post as more information becomes available today. Some evacuees from the West Fork Fish Creek fire southwest of Alberton are being allowed back into their homes this afternoon. "The evacuations along Fish Creek have moved from Cache Creek drainage, and they’ve moved north up to Surveyor Creek," says Breanna Thomasson, fire information officer. Thomasson didn’t have an estimate for how many homes or people the reduction affects. About 300 people were evacuated from the area on Thursday and Friday. The Fish Creek Fire is expected to slow down tomorrow, due to rain that’s predicted for the next three days. There will be a Fire Information Meeting for the community tomorrow night at 7:30 in the Alberton High School Gym. Fire activity increased yesterday with the warmer weather. Firefighters made great progress creating mechanical line along the southeastern edge of the fire, which is being reinforced by the hand crews’ hard work digging handline. Fire personnel are working to use Road No. 7718 on the northern edge of the fire to build indirect fireline. Mechanical line along the northeastern perimeter was tied into fire retardant dropped on the northwestern edge. Air operations are holding the fire front with retardant and bucket drops along the western edge. Planned Actions: Active structure protection is in place for all threatened structures. Firefighters will continue building line around the fire perimeter for further containment. Use of air support for fire retardant and bucket drops will be prevalent in firefighter success. Weather: Tonight will be mostly cloudy with temperatures ranging from 48-52 degrees. Relative humidity will raise to 67-72 percent with southwest winds from 2-4 mph with gusts to 10. Predicted weather shows a drying trend over the next couple of days. This complex consists of the Sheep and Granite Fires in the Flathead National Forest and the Thompson Fire in Glacier National Park. The Sheep Fire is the incident priority due to its proximity to US Hwy. 2, BNSF railway and the community of Essex. Crews and equipment will continue to demobilize today as the need diminishes. Low pressure weather patterns will continue to affect the area thru the weekend. Today, temperatures will be in the 60s with humidity at 25-35%. Winds are out of the West-Southwest at 15-20 mph gusting to 30. There is a 70% chance of rain tonight. Continued minimal fire activity through the weekend is expected. The Sheep Fire is on the Flathead National Forest and burning in very steep terrain with limited access. The fire is about 1 mile south of Essex and about 1/8 mile from the train tracks between Tank Creek and McDonald Creek. The fire showed little activity yesterday. Firefighters continued to build fireline and put out hotspots in the Sheep Creek and Tank Creek drainages. Work on shaded fuelbreaks designed to create defensible space in the Essex area is complete. Logs and slash created by this effort are being moved to a safe location. Structural protection measures are in place in Essex. A night shift will continue to monitor fire movement and patrol the Essex area. The Granite Fire is located west of Marias Pass and south of U.S. Hwy. 2. The fire started in the Great Bear Wilderness and has moved north out of the Wilderness. There has been little fire activity the past few days. Two engines and crews are using existing roads to monitor the fire’s progress. The Thompson Fire is located in remote southern backcountry of Glacier National Park about 15 miles east of the West Glacier entrance in the Thompson and Nyack drainages west of the Continental Divide. A crew will continue removing hoses and pumps. Monitoring fire activity will continue with Aircraft. The Essex area has been placed back in the ‘Set’ Stage of the Ready, Set, Go evacuation model. Residents are advised to remain prepared to evacuate if conditions again warrant this action. For more information, call the Flathead County Office of Emergency Services at (406) 758-2111. U.S. Highway 2 is open with pilot cars escorting traffic between mileposts 176.5 and 185. Escorted vehicles are not allowed to stop in this area. BNSF and Amtrak trains are running. For current road status, call 511 or visit http://www.mdt.mt.gov/travinfo/alerts.shtml. For more information on Amtrak, call (800) 872-7245. "Yesterday the CL-15s from Ontario Canada assisted and we closed the lake for their scooper planes to assist with adding water. Today we have two helicopters doing bucket drops off hot areas and burning parts of the fire on the north east." Twenty-eight homes in the area, just east of Wolf Creek, have been evacuated since Sunday, when the fire started. Beckman says the fire doesn't appear to burning toward the homes at this time. The complex includes the Timber Hills Fire, which is now completely contained. The Bray Fire and Timber Hills Fire were reported Sunday afternoon. The Bray Fire is 5 miles E of Wolf Creek, MT. The Timber Hills Fire is near Craig, MT, approximately 5 acres and 100% contained. Both fires are in steep rugged terrain with the primary vegetation being timber and grass. The Timber Hills Fire was only accessible by foot or air. Firefighters hiked into the area to contain the fire Sunday and aviation support was on the scene to assist. Yesterday and through the evening the fire burned actively on the west and northwest side of the fire. Containment lines are in place for on the northeast side of the fire with minimal smoke and hot spots. CL15s, known as scooper planes, worked throughout the day yesterday scooping water from Holter Lake. This operation led to the closure of lower Holter Lake. Helicopters conducting bucket drops and an air tanker dropping retardant assisted on-the-ground crews in working the fire and slowing its progress. Today’s Activities: Crews will construct fireline and reinforce existing fireline, mop-up 200 feet in from fires perimeter, GPS fire line and utilize air resources as needed. Today will be an active fire day with a Red Flag Warning in effect from noon to 9:00pm. Windy dry conditions will continue to challenge firefighting efforts today putting firefighters on heightened alert with safety as the main priority. North of Heron: The high temperature for most of the area yesterday was 75 degrees with some light winds. This was a good condition for helicopter operations. Both the Skycrane and Chinook helicopters flew on the Klatawa and Berray Mtn. fires. The helicopters were used to cool hot spots discovered during earlier aerial reconnaissance. Great day for flying. Heavy fuels such as dead and down longs are still holding heat but the overall spread of the fires was slow if not halted Wednesday. With the warming temperatures there is a prediction of some gusty winds tomorrow so the additional resources received today including three more engines and a type two crew of 20 people, will be be of great help to crews already working. 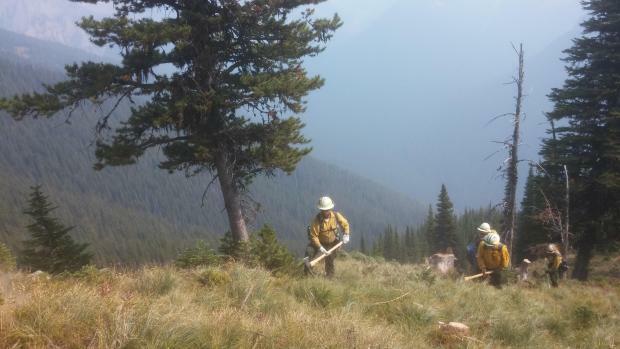 The Bozeman Daily Chronicle reports that crews are mopping up the Willow Fire near Livingston. Current Status: Crews have been actively building hand lines, scouting for potential hand lines, snagging and patrolling control lines. To minimize invasive species spread, personnel are continuing to utilize the weed wash station on all fire vehicles entering the Beaverhead-Deerlodge National Forest. Planned Events: Crews will continue to monitor and patrol control lines and spot fires, as well as monitoring Martin Mine structures as the fire progresses towards them. Due to drying weather conditions, an increase of fire activity is anticipated. Crews are expecting fire spotting up to 1/2 mile. Fire Weather: A RED FLAG Warning is forecast from 12:00 p.m. to 9:00 p.m. Red Flag Warning is a term used to identify conditions that may result in extreme burning conditions. Some factors considered are: a sustained wind average of 15 mph or greater, relative humidity less than or equal to 25 percent and a temperature of greater than 75 degrees Fahrenheit. Bear Creek Fire - Size: 70,610 Acres The Bear Creek Fire advanced slightly on its southern flank, reburning an area impacted by a previous wildfire. No structures were threatened by this expansion. A cooler, wetter weather pattern present over the last two days is forecasted to continue through later this week, providing firefighters with a window to continue containment efforts on spot fires and work on removal of hazard trees and slash associated with the shaded fuel break. Crews have made significant progress on containment and mop-up of the three spot fires. The largest spot fire (76 acres) was contained yesterday; mop-up and hazard tree removal continues all along the Meadow Creek Road. Crews also focused on hazard tree removal and installing a check line where necessary around the smaller 5-acre and 0.5-acre spot fires. Handling hazard trees are especially important for road safety as well as the safety of firefighters. Prepping the forest for the busy hunting season is a priority, while crews continue to monitor fire progress and mitigate safety hazards within the burned area. No additional burn-outs are planned for today. Structure protection (hoses, water pumps, and sprinklers) remains in place at the three guest ranches - Diamond R, Spotted Bear Ranch and Wilderness Lodge as well as the Spotted Bear Ranger Station itself. Some structure protection resources may be re-allocated towards helping with hazardous tree removal operations on the Bear Creek and Trail Creek Fire areas and surrounding access roads. Size: 22,200 acres The Trail Creek Fire expanded slightly on the western side. In response, additional fire break was constructed and tied into an existing trail. Crews continued to primarily focus on hazard tree removal and improving safety throughout the area. Structure protection (wrapping buildings with fire resistant material and placing hoses, pumps and sprinklers in the area) for buildings at Schafer Meadows has been completed. A smaller staff of Type 1 and Type 2 firefighters will remain at the outpost, while the remaining staff will hike out and be reallocated to other areas on the fire. 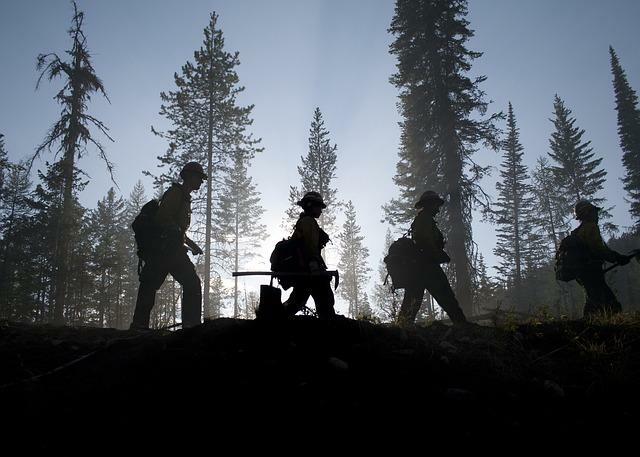 120 personnel are assigned to the all of the fires on the Spotted Bear Ranger District. A number of fires are burning throughout the Spotted Bear Ranger District. 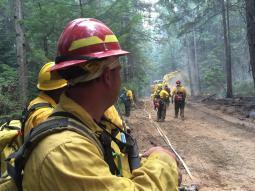 All of the fires have been prioritized based on availability of crews and values at risk. Most of the fires are unstaffed although they are being monitored for growth and fire behavior. Structure protection is in place at threatened backcountry cabins and work stations, including Shafer Meadows, Pentagon Cabin and Black Bear Cabin. Activity is generally low due to the rain; some active fire was observed as areas dried out and wind picked up. 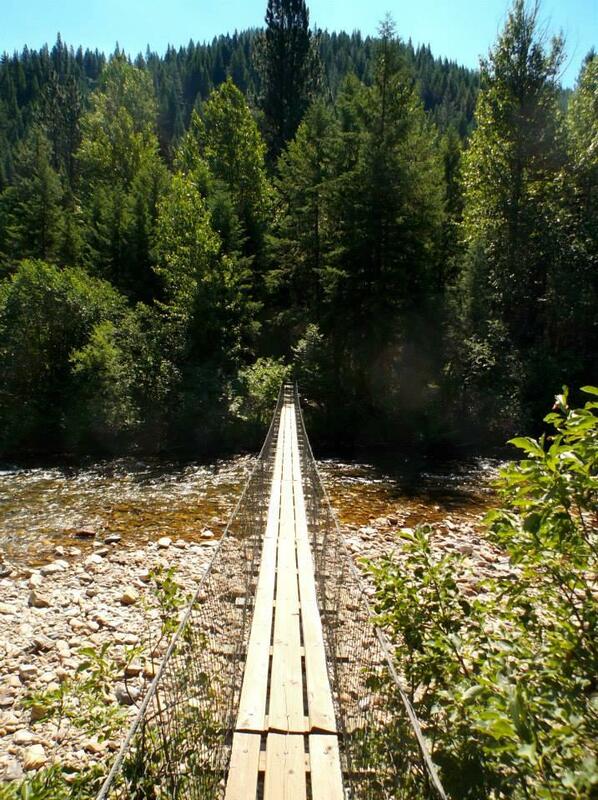 Seeley Lake Ranger District boundary; low to moderate fire activity. In general it’s been another fairly quiet day for wildfires in Montana, with cooler temperatures and higher humidities in the northwest. But, between Helena and Great Falls, Montana's Department of Natural Resources and Conservation reported an active fire day on fires near Holter Lake. The following information was posted to at 8:55 a.m. Sunday, August 30 to the federal government's InciWeb site.